The 15th anniversary of the Cycle Show in Birmingham was the biggest yet, with over 300 of the UK’s brightest and best cycling shops, clothing designers, equipment manufacturers, coaching programmes and purveyors of energy bars, gels, powders and drinks converging on the NEC for what was essentially a three-day festival of the bike. ITV’s Ned Boulting held court on the Protect Your Bubble stage throughout the weekend, interviewing Grand Tour legend Stephen Roche on Sunday afternoon. Roche’s interview proved to be warm, witty and entertaining, and offered insights into the Tour legend’s thoughts on the current state of World Tour racing, the up coming World Championships in Doha, and his son’s move from Team Sky. Ned Boulting introduced the two-time Grand Tour winner to the stage during the afternoon session on the final day of the three-day event. Roche, who won the Giro d’Italia, Tour de France and the World Road Race Championships in the same year, now runs successful cycle camps in Majorca, which have become increasingly popular with Brits following Bradley Wiggins’ winning performances at the Tour de France and London Olympic Games. For the former pro, the bike is clearly still a hugely important part of his life. “If I don’t ride my bike it’s like a pressure cooker…it builds up, then I ride my bike and it goes down again” explained Roche. “When I was young I learned to enjoy cycling, and then I was lucky enough to become a professional. Now I’m back enjoying it again. I participate now – I don’t compete”. Whilst Stephen can now ‘participate’; it is his son Nicolas who does the competing. For the past two years, the younger Roche has been an important member of Team Sky, riding in support of Chris Froome. Prior to that, Nicolas was a member of Tinkoff-Saxo, working as a domestique for Alberto Contador. Roche was brought into Team Sky “with the potential to win small stage races, take stage wins, and be a good team mate to Chris Froome” explained Stephen. Nicolas was identified as a key rider to get into breakaways, and was a huge asset to Sky due to his exceptional race craft. Two years on however, and Nico has made the decision to leave Sky for the BMC Racing Team, once again working alongside his friend Richie Porte. Both Porte and Nico Roche are riders with excellent palmarès and potential, however with Chris Froome so dominant on the road at present, the only way for talented riders of their calibre to fulfil that potential is to move away from Team Sky. Ned Boulting, questioning Stephen Roche on his son’s future, conceded “Sky target the Tour de France” and the pair agreed that, with the current crop of riders led by Froome, there’s little opportunity for a “Plan B” to flourish on the Grand Tours. Sky, it seems, may find themselves as victims of their own success as riders like Roche and Porte move on to pastures new. Once Froome loses that dominance, Stephen Roche is concerned that there’s “no one there to take up that role”. Asked whether situations like that at Sky are a result of the modern pressures upon the sport, Roche agreed. “Racing is totally different now. There are totally different commercial interests…we have Race Radio and power meters, which can make the race a bit boring. In my era, nobody jumped up and down for third place. Now everyone’s racing for a top ten finish. A top ten placing in the Tour could mean a good contract, more money…” On the subject of power meters and other in-race technology, Boulting enquired as to what Roche would change to bring back the sense of excitement associated with his own era of racing. “Abolish car to rider contact, have rider to car contact only. Race Radio damages the spectacle. We have riders too concerned with power meters, detailed data and calculations. We do need to move with technology – don’t just throw it out – but make it better. Otherwise we have riders, tactically not knowing what to do by themselves”. In the current pro peloton, Roche is impressed with a number of young riders coming up through the ranks. “A Grand Tour rider survives the time trials, the climbs, the wind, the rain, the crashes…one good thing to come out of the Tour de France are the skilled young riders – Quintana, Bardet, Yates, Alaphillipe…” His son’s former team mate, Contador, also impresses. “He is a great asset to cycling. He is tactically good, he doesn’t wait until the last climb, he throws down the gauntlet. We need riders like this”. In view of the upcoming World Championships, Roche was asked which recent World Road Race Champion has impressed him the most. “Certainly Sagan, but it would have to be Thor Hushovd. He was 90 kilos, so he had to get points ahead of the other sprinters, going away on mountains for the intermediate sprint points. He was a great sprinter, an intelligent rider. A nice guy, with tactical sense”. As for the upcoming World Championships in Doha, Roche didn’t fancy the course much! “It’s totally flat. In a desert”. So who does he back to win? “A sprinter. But I’d like to see Tom Boonen win, he could climb off his bike and say he stopped on a high note, but it will be very difficult for him. The wind could blow sand across the road. It’s a sprinters day”. Roche prefers the 2018 course, when the World Championship comes to Austria. “It’s a very hard circuit” he explained, and could possibly see the rainbow jersey conferred upon a Tour contender once again. “People are wishing for it to happen”. On the subject of jerseys, Ned Boulting asked which was the most prestigious in the cycling world – the World Champion’s rainbows or the maillot jaune? Peter Sagan, taking both the yellow and green jerseys at this year’s Tour de France – whilst simultaneously being the World Champion and entitled to wear the associated rainbow jersey – famously quipped “If I lose yellow, I have green. If I lose green, I have rainbow”. Roche, debating the merits of each, revealed one of his greatest career regrets. “I regret not being able to wear my rainbow jersey much due to my knee injury”. Like Roche, Sagan hasn’t been seen in the stripes too often, although this has been due to the number of points and leader’s jerseys he has accumulated in his World Championship year. “If I were him, I’d have been frustrated to have to wear the green jersey (at the Tour de France). You only get one chance to wear rainbow”. Before it was time for Roche to go, Ned Boulting asked if the audience had anything they’d like to ask the Tour legend – “it’s not every day that you have Stephen Roche answering your questions!” After answering a number of questions from the floor, Roche was asked “what’s your least favourite mountain?” Spinning the answer in a more positive light, Roche replied “there wasn’t one I didn’t like – but some didn’t particularly like me!” Relaying the story of his first ever attempt at Alpe d’Huez on the Tour when he was a new face in the peloton at 23, Roche told the Cycle Show “I forgot to eat. It was lights out at the foot of the Alpe!” The mountain may have had other ideas, but the 23-year-old Roche wouldn’t have dreamed of giving up. He rode on, finishing almost twenty minutes down on the bunch, but crossing the line none the less. “Alpe d’Huez is an incredible climb…it has to be treated with respect”. It’s a story which sums up Roche’s entire interview – peppered with humour, humility and honesty, whilst showing the reverence with which he held – and still holds – the sport he loves. A story of the bike, of the road, and above all, of humanity – le Tour in microcosm. And with that, Stephen Roche leaves the stage, to greet fans clutching pens and programmes, autograph ready. Almost thirty years on from his golden 1987, Stephen Roche is still a charismatic champion with the ability to inspire, one of the greats, and a fantastic ambassador for the sport. Chapeau Mr Roche, and also to the Cycle Show – same time next year? 30 Seconds With……Jasper Bovenhuis of An Post Chain Reaction! What was your first ever bike like? A white MBK, with tube gearing and toeclips. What’s on your MP3 Player? All kind of music, listening a lot from the top 40 hit-chart. Billed in the Official Tour of Britain programme as An Post Chain Reaction’s ‘One to Watch’, Jasper Bovenhuis had a great week riding his first edition of the British race, taking home the Yodel Direct Sprints jersey, and racing the streets of Bristol as the Most Combative rider of the previous day. We caught up with him to see what he thought of the 2016 Tour of Britain…. Congratulations on winning the Yodel Direct Sprint jersey at this year’s Tour of Britain! When you started the race was that one of your aims? Thank you, yes for me it was a goal from the start of the Tour of Britain, trying to win the Yodel Direct Sprint jersey. What was your most memorable moment in this year’s Tour of Britain? The last stage was the best of all, riding in big crowds through London. And winning the last point, so I could bring home the jersey. How do you prepare for split stages like the Bristol stage at this year’s Tour of Britain? Riding 2 stages in a day always costs a lot of energy. For me, I just make sure I have enough fuel in the body during the day, and take as many rest moments as possible in between the 2 stages. Jasper Bovenhuis wears the Yodel Direct sprint jersey at the 2016 Tour of Britain, Stage 7b, Bristol. 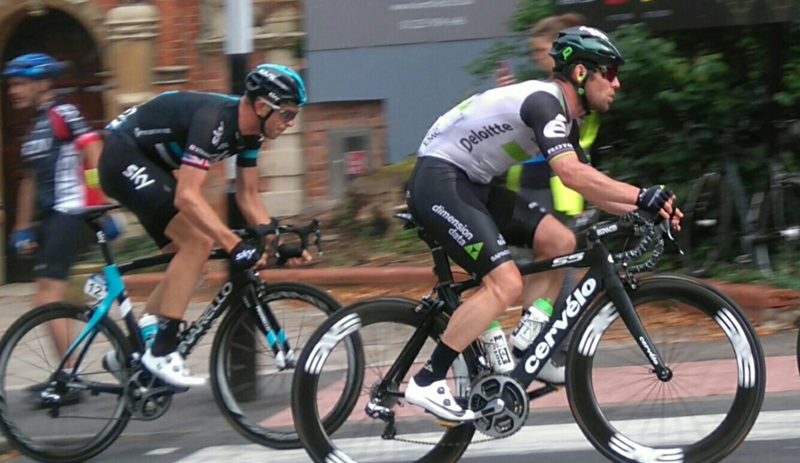 How does riding the Tour of Britain compare to racing on the Continent? Racing in Britain is totally different than elsewhere. The roads are really grippy a lot of the time, and besides that the road is never flat, that makes it really hard to race on. Were you surprised by the level of support for the Tour of Britain when you came to the UK? I didn’t really know what to expect, because I don’t race that often in the UK. But it was great to see that there is a lot of support for the Tour of Britain itself, and that there is a big amount of cycling fans! What did winning the Yodel Direct Sprint jersey mean to you personally, and to the team? For me personally it was a great win, especially because it was racing at the highest level I have ever done, 2.HC. For the team it was also really good, getting a lot of media attention and TV minutes. How did you become involved with cycling at a professional level? When I became a first year U23 rider I got a contract at the Rabobank Continental team and stayed there for 4 seasons. I’ve already been racing for 7 years on the ‘continental’ level of cycling. What do you hope to achieve next season? Hopefully I can keep developing myself, and get some nice victories next season. Finally, what would you say to any young riders just starting out on the road? Make sure you keep having fun riding your bike, that’s the way you can make the most out of cycling. And the most important – stay safe on the road. Thanks Jasper! We wish you all the best for the 2017 season and really hope we see you back to defend the Yodel Direct jersey at the next Tour of Britain! Don’t forget to check out Jasper’s 30 Seconds With…. answers on our Café Run page! Both the final Monument of the year, Il Lombardia, held on Saturday, and Sunday’s Tour de l’Eurometropole finished with an air of controversy surrounding the podium places of each race’s top two riders. Saturday’s Il Lombardia, won by Orica-BikeExchange’s Esteban Chaves, saw Astana’s Diego Rosa attack twice in the final kilometres, although both surges proved fruitless as his closest rivals, the Columbian pairing of eventual winner Chaves and Cannondale-Drapac’s Rigoberto Uran, were too strong for Rosa to break. After the race, which saw the Astana rider take second place, Rosa’s Directeur Sportif told the press that he felt ‘truly sick’ at the outcome, claiming that his rider ignored orders. “If Rosa had listened to me, he would have won”, explained Giuseppe Martinelli, DS for the Astana team. “I’ve only been this upset a few times in my life…you can’t throw away an occasion in that way. You can’t lose like that”. Martinelli told reporters that Rosa should not have expended energy in his two fruitless attacks, and should instead have sat in the wheels on the last two climbs, and made sure he was second wheel in the finishing straight. “It was clear the other two would help each other, it happened at the Giro d’Italia…instead, he went through first”. For his part, Rosa admitted that his attack “at 1600 metres was useless”, but claimed that, as Chaves would outsprint him, he had to “play my hand, a surprise. I believed. I knew that curve at 250 metres. Uran obviously closed the gap to me, but I don’t want to cause polemics…if I had made it through with two metres on them then it would have worked”. Sunday’s Tour de l’Eurometropole also finished with the second placed rider at the heart of a controversy. IAMCycling’s Oliver Naesen claims that LottoNL-Jumbo rider Dylan Groenewegen deviated from his line in the final sprint, causing Naesen to be pushed towards the barriers and therefore become boxed in. He even had to hop over an obstacle on the road surface before crossing the line in second place behind Groenewegen. Similar circumstances have seen riders disqualified for their blocking actions, however on this occasion the race jury deemed Groenewegen to be the winner regardless. Naesen was clearly unhappy with the decision, claiming to be the ‘rightful winner’. Under the UCI rules, riders are ‘strictly forbidden to deviate from the line they selected when launching a sprint’. The regulations have seen Boudhanni disqualified for cutting into Caleb Ewan’s race line at Cyclassics Hamburg, and Andre Greipel famously fell foul of the rule at the 2015 Tour of Britain. Naesen, clearly outraged by Groenewegen’s actions, attempted to confront the LottoNL-Jumbo rider in the finishing area, but was blanked by the Dutchman. Groenewegen told the press “that was chaotic as the leading group was caught in the final metres…I certainly went to the left but I left enough room to pass”. Naesen’s team later posted a video on their Twitter feed from CyclingHub, showing Boudhanni’s disqualification from Cyclassics Hamburg, adjacent to the Tour de l’Eurometropole finish, highlighting the similarities between the two incidents. No official statement was made on the social media page, however the CyclingHub retweet made the team’s feelings clear. Naesen is certain that he is the ‘rightful winner’, but the official results still show Groenewegen’s name.